The concept of All on 6 and All on 4 Dental Implants were developed as a way to best restore the full arches of the upper and lower jaws. The procedure uses 4-6 implants to secure all missing teeth in place hence, the name All on 4/All on 6. This provides patients with highest quality fixed full teeth restoration without unnessecary cutting gums in the shortest time possible. Previous treatments required patients to receive a total of six or more implants, with treatment extending throughout 18 months of treatment. The patients were then forced to leave the dental practice without any teeth or a poor fitting temporary denture for over a year! With the All on 4 / All on 6 procedure, we make sure our patients leave our Dental Implants Clinic smiling- with a brand new fixed set of replacement teeth! In order for our experienced dentist, Dr Dariush Hoshyar, to properly evaluate your case you will initially require a consultation and diagnostic appointment in order to best determine the treatment path necessary for your case. This includes determining whether or not your case will require extractions, gathering the appropriate information via X-rays, Panoramic and CT scans and impressions and any other photos required. 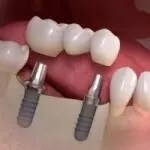 Directly after this consultation, the patient is scheduled for implant surgery in which the new replacement teeth are fitted and adjusted all in one appointment, including any necessary extractions. 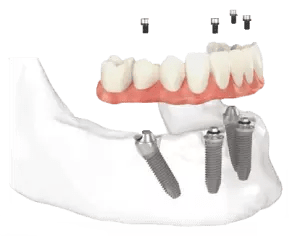 Once the implants are secure, the abutments will be attached so that the replacement teeth can be fastened and adjusted for maximum comfort and function giving you a brand new radiant smile. Because only few implants are used in the procedure, the entire process is much less invasive and involves less surgical time than previous treatments. The beauty of this new procedure is the sheer convenience. Special implants were developed for this treatment allowing for the immediate fitting of replacement teeth to the abutments. This means that with only 4-6 implants, patients can leave our implant clinic with a full set of new replacement teeth within only one appointment! In majority of cases no bone grafts is necessary! 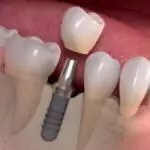 Dental implant for a single missing tooth! 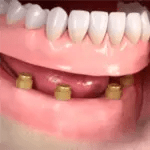 Dentures fixed with implants !